Thyro3 tablets (Generic Cytomel) contain Liothyronine Sodium which is a synthetic version of the naturally occurring hormone in the body called thyroid hormone. Thyroid hormone is essential for the regulation of energy and metabolism in the body. It is also required for cell growth. When a person’s body does not produce sufficient amounts of thyroid hormone, that person is known to be suffering from hypothyroidism. Liothyronine Sodium tablets (Thyro3) are prescribed as oral replacement therapy for the treatment of myxedema coma in hypothyroid patients to restore the thyroid levels back to normal. Thyro3 25 mcg tablets are also useful for the treatment and prevention of goiter, an endocrine disorder which is characterized by an enlarged thyroid gland. Liothyronine Sodium T3 tablets are also used by body-builders to enhance the burning of excess fat in the body to improve muscle mass. In our online pharmacy, Thyro3 tablets, also known as generic Cytomel T3 are available in the strength of 25 mcg of Liothyronine Sodium. We also have in stock Eltroxin (old formulation by GSK) containing Levothyroxine which is also used to treat goiter. Thyro3 tablets. 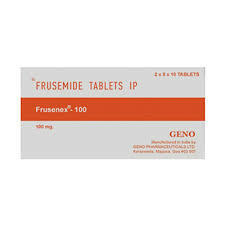 Generic Liothyronine Sodium tablets, also known as Generic Cytomel are also available under different brand names such Triostat tablets. The active pharmaceutical ingredient in Thyro3 tablets is Liothyronine Sodium. Each Thyro3 tablet contains 25 mcg of Liothyronine Sodium. The inactive ingredients present in Thyro3 pills are calcium sulfate, gelatin, starch, stearic acid, sucrose and talc. What are Thyro3 Tablets Used For? 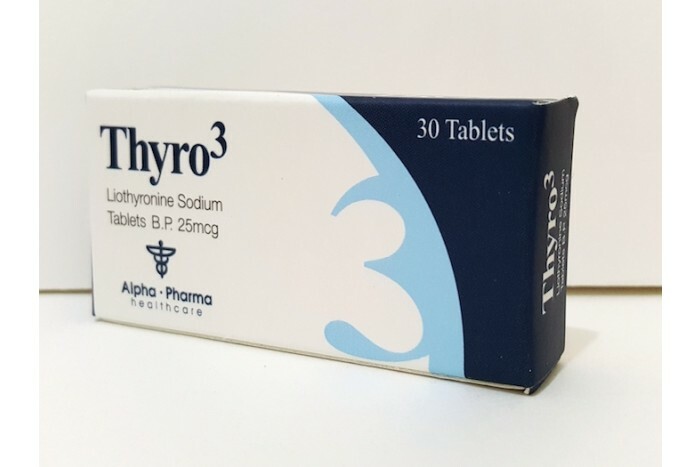 Thyro3 25 mcg tablets, manufactured by Alpha Pharma, contain Liothyronine Sodium, which is the artificial form of the naturally-occurring thyroid hormone in the human body. Liothyronine Sodium tablets are typically administered as oral replacement therapy in patients who have lower levels of the naturally produced thyroid hormone (hypothyroidism). 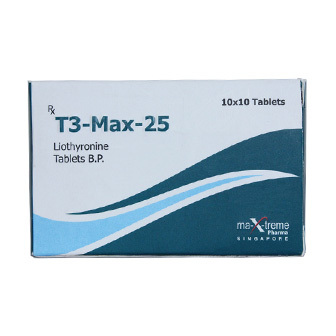 Liothyronine Sodium tablets helps to restore the deficit of thyroid hormone in the body and helps in the treatment of myxedema which develops in hypothyroid patients. Liothyronine Sodium tablets are also administered to patients who have developed hypothyroid states as a result of thyrotoxicosis treatment. Thyro3 pills are also useful for the treatment and prevention of an iodine deficiency disorder called goiter, which is characterized by an abnormally enlarged thyroid gland. Liothyronine Sodium tablets are also taken for the purposes of body building. Since Liothyronine Sodium tablets increases the metabolism rate of the body and efficiently utilizes carbohydrates, fats, and lipids present in the body, professional body builders’ use Liothyronine Sodium T3 tablets to burn off excess fat accumulated in the body. Liothyronine Sodium T3 tablets are also used in combination with steroid hormones to enhance the utilization of proteins by the body to improve the rate of new muscle accumulation. Thyro3 Dosage – How to Take Liothyronine Sodium Tablets? You should use Thyro3 tablets (Generic Cytomel) exactly as recommended by your doctor. Your doctor may suggest a dosage of Liothyronine Sodium tablets depending on your medical requirement, body weight, other medical conditions, and current medications. Thyro3 25 mcg tablets should be once a day. You can choose to consume Liothyronine Sodium tablets with or without food. Try to maintain a regular schedule for the medication such that you take Liothyronine Sodium tablets at the same time every day, so that you get the maximum benefit of the medication. Usually, doctors recommend a starting dosage of 5 mcg Liothyronine Sodium, once a day. They may increase this dosage to 10 mcg Liothyronine Sodium daily for 1 or 2 weeks. When a patient reaches a daily dosage level of 25 mcg Liothyronine Sodium, the dosage may be further increased every week or two by 12.5 mcg or 25 mcg. The usual dosage for thyroid level maintenance is 75 mcg Liothyronine Sodium daily. In senior citizens or children, therapy should commence with 5 mcg Liothyronine Sodium daily and increased only by 5 mcg increments at the suggested intervals. Your doctor may alter the dosage of Liothyronine Sodium tablets and dosage period depending on your response to treatment.